THE PUBLIC ACCOUNTS Committee (PAC) has referred a letter containing “a number of serious allegations” against individuals linked to Rehab to the gardaí. PAC chair John McGuinness said that the letter contains a “a number of serious allegations against named individuals who have or had associations with Rehab Group”. He said that on legal advice, the letter has been referred to the gardaí as it “could potentially involve criminal wrongdoing” and falls outside the remit of the committee. PAC met in private session for over an hour this morning to consider the letter from Kelly and other matters related to Rehab. The committee also heard that information sought from Rehab has not been provided including details of pension arrangements and consultancy work carried out by Frank Flannery. McGuinness said that information provided by Rehab in response to 12 queries from PAC “falls short” of what was asked for. Independent TD Shane Ross described the information provided by Rehab as “a smokescreen”, saying that the Towers Watson report on executive pay at the disability charity was incomplete and amounted to a Powerpoint presentation. He said the information provided by Rehab is “deliberately obscure and literally makes life harder and more difficult”. The committee has set a date of 10 April for its next meeting on Rehab. The group’s chairman Brian Kerr, CEO Angela Kerins, Flannery, the director of finance and the remuneration committee will be asked to appear before TDs. 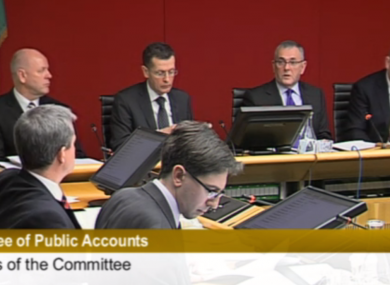 Labour TD Gerald Nash said he was “quite astonished at the scant information” Rehab had provided to the committee. McGuinness said that Rehab’s reluctance to provide full information was doing “untold damage”. He said the group should come before the committee with full information and “answer the questions directly”. He also stressed that it was the “unanimous view of the committee” that Flannery and Rehab come before it and asked that “ministers and members of both houses should take note of that before they make comment”. “In terms of Mr Flannery, it isn’t a personal thing,” the Fianna Fáil TD added, referring to the now former Fine Gael strategist. Explainer: Who is Frank Flannery and why is everyone talking about him? Email “PAC refers serious allegations about Rehab to gardaí”. Feedback on “PAC refers serious allegations about Rehab to gardaí”.